Gardeners don't need to fight off deer to stay away from trees. Just get tree protection from Deerbusters.com. Often, fruit growers have a problem keeping away deer from their fruit trees -and it isn't just because bucks and does are eating the fruit. 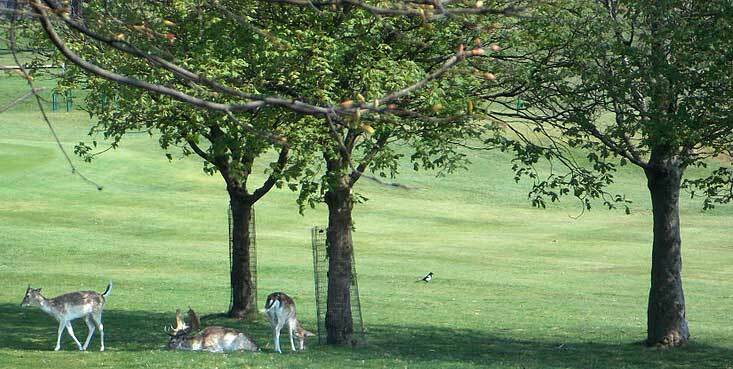 Deer feed on the tender shoots of trees and also rub their antlers on the trees, causing damage to the bark. From September through November, bucks will rub their antlers against small, or young trees, usually one to three inches in diameter to rid the dried-out velvet from their antlers. This annual process occurs the same time each year in preparation for the breeding season where they can appear more attractive to does. When damage to trees occurs, Deerbusters recommends tree guards to protect all types of trees. Deerbusters tree wrap is made from our toughest poly carbon fence mesh material to stop deer and other wild animals from damaging trees on lawns. Deerbusters tree protection products offer a breaking strength of approximately 1400 lbs/feet to stop even the largest animal from damaging tree bark and root systems. These bark and tree guards are sure to last at least 30 years in the field. Get tree protection now with the help from Deerbusters.